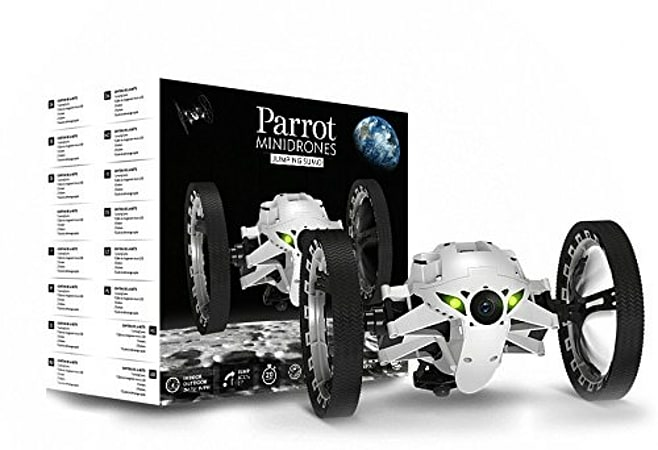 Parrot Minidrone Jumping Sumo Insectoid - White. The Parrot Minidrone Jumping Sumo Insectoid is a fast and incredibly agile remote controlled car that you can control from your tablet, giving you hours of fun wherever you are. The Jumping Sumo Insectoid features a built in video camera that captures all the amazing acrobatic action and streams it to the screen of the smartphone or tablet you're using to control the car. If you've got a Wi-Fi enabled smartphone or tablet, you can control your Minidrone Jumping Sumo Insectoid via 2.4 or 5 GHz Wi-Fi, racing the car around as you please. You'll get a real kick out of all the tricks your Parrot Jumping Insectoid Racing Car can pull off. Execute thrilling rolls, turn 90 degrees with incredible accuracy at speed and carry out impressive jumps (up to 80cm). You'll get a first person perspective on what its like to be inside a tiny remote controlled car zipping around the lounge, office or park. 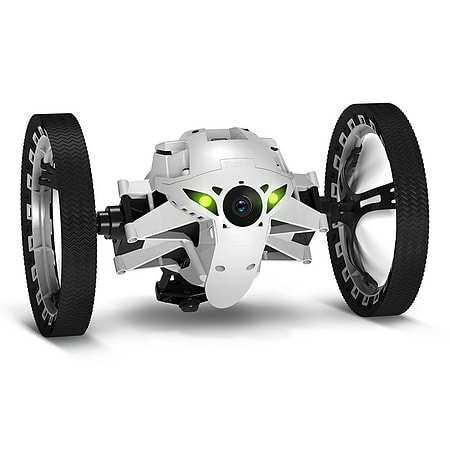 The half insect, half robot toy is fitted with a gyroscope and accelerometer that allow it to move naturally and give you intuitive control, so you can perform the stunts you've always wanted to with a remote controlled racer.